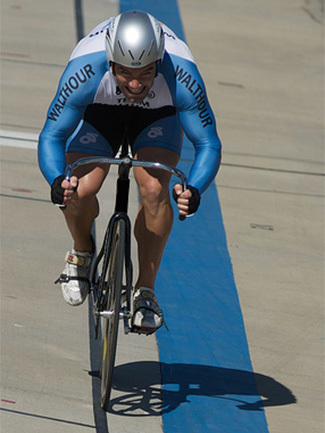 Bobby Walthour IV is the fourth generation of the long Walthour legacy in American Track Racing. Bobby Sr- Induction 1989, Jimmy Walthour- Induction 2008, Bobby Walthour Jr- Induction 2011. Bobby continued the family tradition starting in 1985 at the Hellyer Velodrome in San Jose, CA. He quickly became a national-level racer resulting in opportunities to represent the United States internationally and as a member of the US National Team. Thirty-plus years later, Bobby is still racing at the elite level. Bobby IV owns Dixie Flyer Bicycles with the mission to promote American cycling and the rich Walthour family tradition. Bobby is a proud member of the US Bicycling Hall of Fame Board of Directors because it provides the opportunity to preserve the long and amazing history of American bicycle racing.